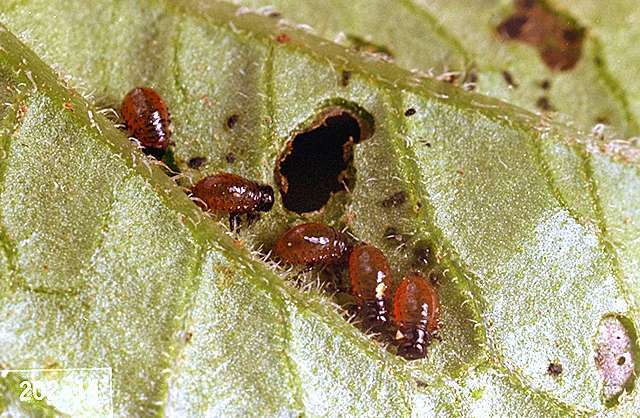 Pest monitoring Colorado potato beetle populations initially are aggregated but tend to disperse over time. Plants can lose up to 30% of their foliage without yield loss. 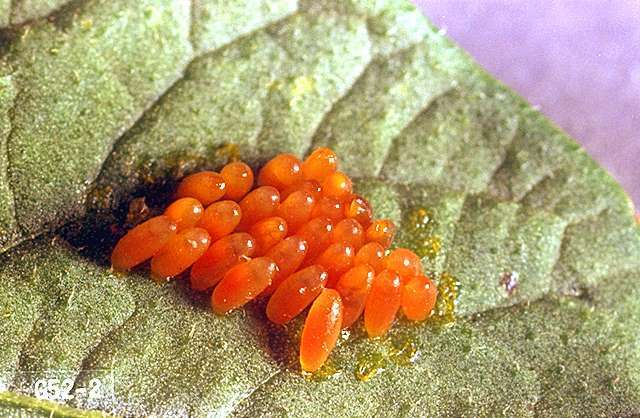 Generally, insecticides are not needed unless beetles or larvae average more than one per plant. 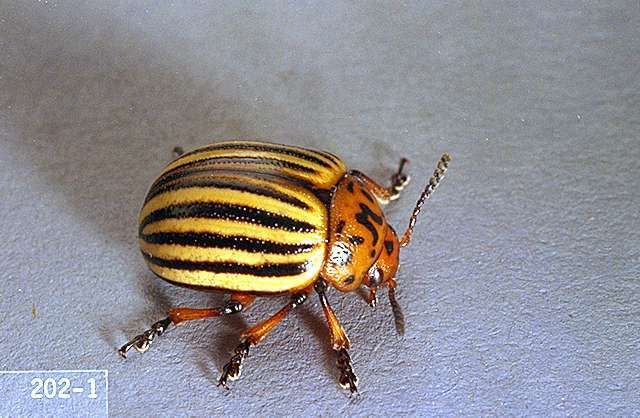 Beneficial insects, such as predatory stink bugs and parasitic flies, and birds help to reduce Colorado potato beetle numbers somewhat, but they cannot be counted on to provide adequate control. acetamiprid (Assail 30SG) at 0.028 to 0.047 lb ai/a. PHI 7 days. REI 12 hr. Retreatment interval 7 days. Limit 4 treatments per year. Do not exceed 0.3 lb ai/a or four treatments per season. chlorantraniliprole (Coragen) at 0.045 to 0.098 lb ai/a as chemigation or foliar treatment. PHI 1 day. REI 4 hr. Do not exceed 0.2 lb ai/a per season. Retreatment interval 5 days for foliar and 10 days for chemigation. cryolite (Kryocide) at 7.7 to 15.4 lb ai/a. PHI 14 days. REI 12 hr. cyromazine (Trigard) at 0.125 lb ai/a as a foliar spray. Minimum interval between treatments 7 days. PHI 7 days. REI 12 hr. Do not apply more than 0.75 lb ai/a per season. Suppression only. dinotefuran (Scorpion 35SL) at 0.05 to 0.18 lb ai/a foliar and 0.23 to 0.27 lb ai/a for soil. PHI 1 day (foliar), 21 days (soil). REI 12 hr. Do not exceed 0.266 lb ai/a (foliar) or 0.532 lb ai/a (soil) per season. esfenvalerate (Asana XL) at 0.03 to 0.05 lb ai/a. PHI 1 day. REI 12 hr. Do not exceed 0.5 lb ai/a per season. Do not feed or graze livestock on treated vines. flupyradifurone (Sivanto 200SL) at 0.14 to 0.18 lb ai/a PHI 1 day. REI 4 hr. Retreatment interval 7 days. Do not exceed 0.365 lb ai/a per season. imidacloprid (Admire Pro) at 0.25 to 0.38 lb ai/a soil or 0.047 to 0.079 lb ai/a foliar. PHI 21 days soil; 0 day foliar. Retreatment interval 5 days foliar. REI 12 hr. Do not exceed 0.38 lb ai/a soil per application or 0.24 lb ai/a foliar per season. imidacloprid (Provado, Prey) at 0.048 to 0.078 lb ai/a. PHI 0 days. REI 12 hr. Retreatment interval 5 days. Do not use more than 0.24 lb ai/a per season. oxamyl (Vydate L) at 0.5 to 1 lb ai/a. PHI 3 days. REI 48 hr. Do not exceed 8 lb ai/a per season. Drip irrigation permitted. permethrin (Ambush 25WP, Pounce 25WP) at 0.05 to 0.2 lb ai/a. PHI 0 days. REI 12 hr. Retreatment interval 7 days. Do not exceed 0.6 lb ai/a Pounce or 1.2 lb ai/a Ambush per season.